Prior to 1992, the most dramatic renovation to Bryant Park happened in 1934. On January 1 of that year, the park was a much-lamented eyesore, due to a lack of money and leadership, and the legacy of a failed exhibition featuring a replica of Federal Hall. There was also, however, a tremendous amount of energy being expended by persons wanting to save the park. One such effort occurred in late 1933, when the Architects Emergency Committee, formed to provide relief for unemployed architects, held a contest calling for plans to renovate the park. That contest was won by Queens architect Lusby Simpson, and all 40 entries were displayed at the Ziegfeld Theater in November, 1933. That victory netted Mr. Simpson $100 and not much else, as the contest was private and merely added to the plethora of possible plans for the park. This photo shows Mr. Simpson surveying work on the park from the western edge. The real change came in 1933 with the election of the reform-minded Fiorello LaGuardia as Mayor of NYC. LaGuardia knew that the prevailing situation, wherein the city’s parks were directly administered by borough Presidents who often had no expertise in the field, was inadequate. LaGuardia proposed that all of the city’s parks be administered by one true Parks Commissioner, and nominated Robert Moses for the post, who already chaired the New York State Park Council, was President of the Long Island State Park Commission. State lawmakers didn’t want Moses to hold all those positions, but after some intense lobbying in Albany, the appointment came through and Moses wasted no time. 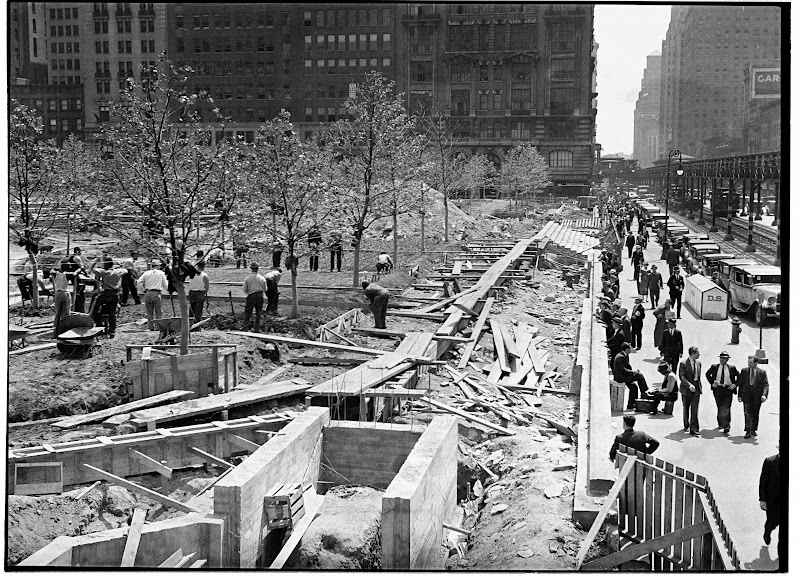 Using Simpson’s plan as a basis, Moses directed an incredibly quick refashioning of Bryant Park in 1934. The park was raised four feet from the street, a broad lawn was installed, and the entire park was surrounded by a granite wall topped by a wrought-iron fence. 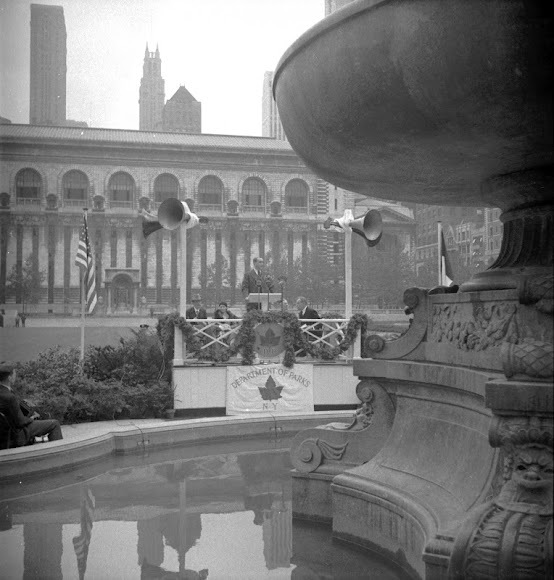 The Lowell Fountain (picture taken at the opening dedication ceremony on September 14, 1934) was moved from the shadow of the library to its current position on the west end of the park, and 270 London Plane trees were planted. Though the effect was lavish, the renovation cost was relatively modest, as workers from the New Deal-era Civil Works Administration were employed. In little over six months, the park was transformed from a waste heap to an attractive accompaniment to the Beaux Arts magnificence of the New York Public Library. Praise was generally lavish, but not everyone was thrilled. Lewis Mumford, longtime architecture critic for The New Yorker, famously dissented. After perfunctorily admitting that anything was better than the previous situation, his objections centered on the fact that the east-west orientation led to a spectacular vista of…the Sixth Avenue El train. That structure had plagued the park since the 1880’s and was finally torn down in the late 1930’s. That was good news for the park, but unfortunately, that demolition, coupled with the construction of the Sixth Avenue subway, dominated the park for years. 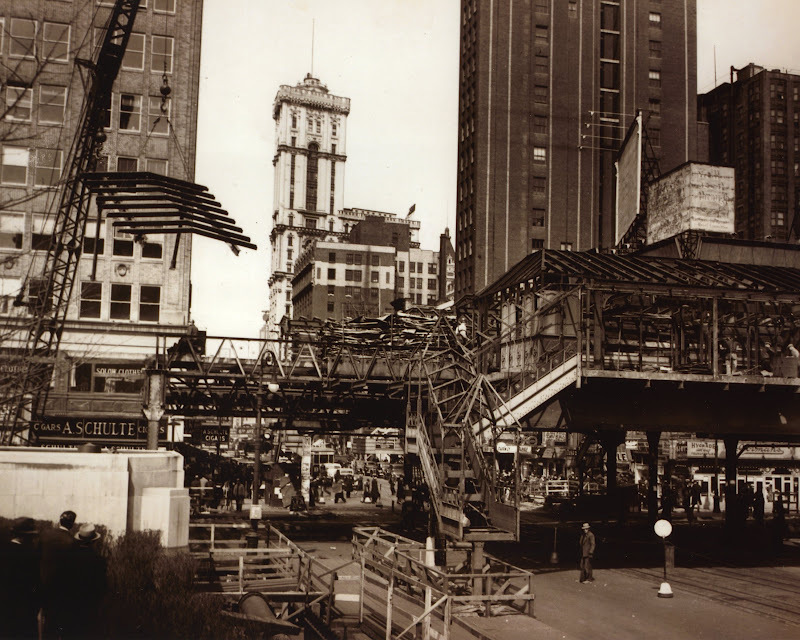 This photo of the El being torn down gives a good idea of just how unsightly it was. There were other problems with the design, not immediately apparent. As discussed here before, the elevation of the park removed it from the ebb and flow of pedestrian traffic (check out this photo to see the effect the elevation wrought). Also, the stone walls, the relatively few entrances, and tall hedges inside the park exacerbated an urban problem that Moses and Simpson could not have anticipated: the open selling of illegal drugs. Whatever the defects, the 1934 rehabilitation of Bryant Park established some important precedents. First, the need for a breathing space in midtown-Manhattan was widely acknowledged; second, business and building owners in the area made it clear that they believed a thriving park was essential for the success of the entire neighborhood; and third, the changes that strong leadership could bring to bear on a seemingly forlorn cause was made apparent. The old photo of the Lowell Fountain shows its deep history. The majestic fountain is so big that it provides a beautiful statement to the park.